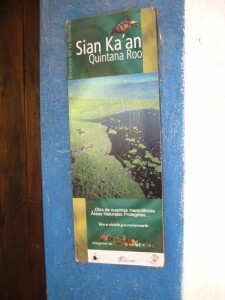 We had an amazing trip through a variety of wetland habitats and ancient Maya ruins in the biosphere of Sian Ka’an. It was expensive and hard to get to, but well worth the trip in so many ways. Our tour guide Aldo is an interesting man. Born and raised in the area, he is Mestizo; a mix of Mayan and Spanish blood and many cultures. His wife is German and she assists him in running the tour business. She has an advanced degree in Global Tourism. 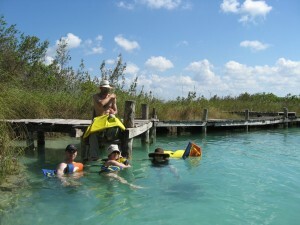 His five hour tour features a boat ride through a variety of habitats, hiking through an archaeological site, lunch in Maya ruins at a spot where the ancient Maya had a post to help control trade through the canal, and finally a leisurely “float” down the canal. I couldn’t be in the sun as much as my traveling companions, so I opted to stay in our boat in the shade with Aldo and hear his explanation for why tourists come to this, and other Mayan sites. Aldo turned out to be a passionate New Age believer. Relating his beliefs to the ancient Maya Long Count calendar and the date of December 11, 2012, Aldo explained that the cycles of the cosmos are coming to an end. But unlike many New Agers from the United States, Aldo takes a Mayan perspective on this cycle. The world will not end, but enter a new phase when “cosmic power” will come down and move all people to the next cycle. Those individuals who vibrate on a higher “frequency” (the “good” more advanced people who recognize the need to care for the people and environments of the world) will move on to a better and special place created for them that is different from the place that those operating on a “low” frequency (or bad people who take advantage of others and pollute the environment) will find after the cycle changes. Aldo explained that all civilizations rise and fall, so what use is material wealth. We should enjoy life now; take things as they come. He believes that many tourists are drawn to his tour, and indeed other Maya sites for reasons that they may not completely comprehend. 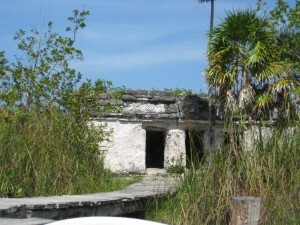 It is possible that those tourists who seek out ancient Maya sites are actually reincarnated Maya from the past, those who may have lived here and return to find that these buildings remnants of civilization are familiar because of their previous lives here. Aldo sometimes thinks he hears voices talking in Mayan. It also might be that these archaeological sites are doorways to alternative dimensions; perhaps in another dimension the Maya did not fall, but are still inhabiting these sites in balance with the land. I now understand the growing literature on “mystic tourism” that our conversation beautifully illustrates; a syncretised belief system that explains the toured and the tourist in a very different way that other materials we have read this year.